Maria Skłodowska-Curie ‒ she used both names ‒ was a trailblazer in more than just science. More than ever, her strong principles and ground-breaking ideas are worth discovering, particularly for what she can teach us today. Despite all those obstacles she managed to emigrate to Paris, graduate from the Sorbonne, and meet, marry, work and win a Nobel Prize with Pierre Curie for discovering the new elements of radium and polonium. In addition, she proved to the world that women could be great scientists as much as men, which was far from obvious at that time. Later in life, she overcame her husband’s tragic death and went on to single-handedly raise two children, win another Nobel Prize, become a superstar/celebrity, contribute to the foundation of the most important radium institutes in Europe, and become a war hero and the first woman ever to be buried at the Panthéon. Maria Skłodowska-Curie didn’t become the most respected person in the world of science ‒ completely dominated by men at the time ‒ without a plan and a strong will to succeed. Carrying those heavy containers was an exhausting task. I was also very tired with boiling the ore for long hours while keeping it in constant motion with an iron stirrer. They worked for free for 4 years, doing things a lab assistant would normally do, risking their health and careers, and turning down comfortable offers from a few universities (such as from Geneva) just because they believed in a greater cause. It paid off – she received the Nobel Prize in Physics, the first in history awarded to a women. None of us ever intended to make any profit out of our discovery. Thus, we didn’t apply for patents and we always publicly announced the results of our studies as well as methods of extraction of the pure radium from the ore. Moreover, we always shared all our knowledge with other scientists whenever they asked us to. We found it very beneficial for the fabrication of radium (…) giving scientists and doctors the materials they needed. This altruistic stance contributed vastly to the development of medicine (radiologic examinations and cancer treatments) and industry (industrial radiography) and science. 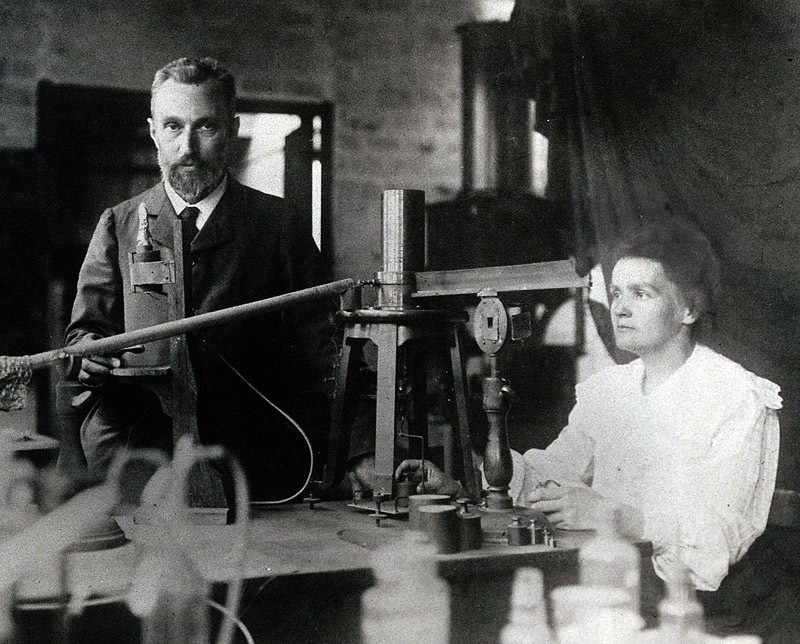 Eventually, the properties of radium attracted the richest investors and Maria Skłodowska-Curie could have made billions on it but instead she chose to use almost all the income it generated for further research into radioactivity and the founding of radium institutes. 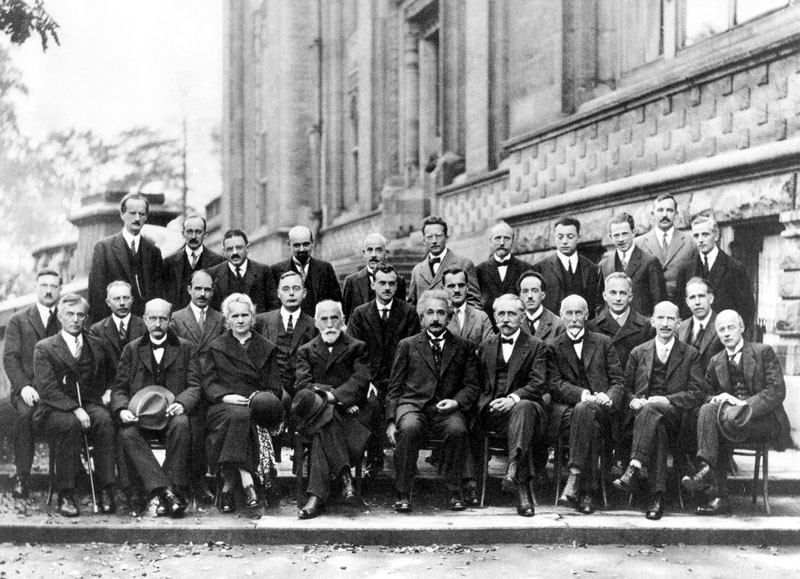 Again, let’s look at the photo below; it was taken during one of the most important scientific congresses – the 5th Solvay Congress. It speaks for itself. The world of science and politics was absolutely dominated by men and even after she got her first Nobel Prize (jointly with her husband and Henri Becquerel – the discoverer of the first evidence of radioactivity) she was still regarded as Miss Curie – her husband’s assistant. Once again, she had to prove her qualities by extremely hard work and by standing on the front line of the debates on radioactivity. That wasn’t easy – several scientists were working on the same subject at that time and often didn’t spare misogynistic comments in the course of discussions. Never intimidated, she won eventually, and in the most triumphant way possible – she was awarded her second and, this time individual, Noble Prize for further investigations into the properties of radium, polonium and their compounds. (…) the Curies’ discovery was a sensation, not only among scientists but also among public at large. Radium was rare, radium was expensive, and radium was a panacea! The popularity of radium went as far as bringing on some sort of radium-mania. Entrepreneurs started releasing all kind of products containing radium (mind that its harmful properties were not yet discovered at that time): cosmetics, toothpastes, bracelets, drinks, medicines and even fodders! Radium became a magical object authors wrote books about, such as Paul d’Ivoia’s La course au radium (The Chase For Radium) or Raoule Marquis’ Radium Cave. Photographers and journalists from all corners of the world tormented us all day long. They went as far as quoting our daughter’s conversation with our cat – Bona. We received numerous requests for money and autograph hunters, snobs, worldlings and even scientists will pay us unexpected visits at our ‘wonderful’ facility at Rue Lhomond. Things got even worse after Pierre’s tragic death in 1906. First, newspapers invented many conspiracy theories surrounding his death (in fact, he was just jaywalking and got hit by a passing coach) and in 1911 a real tabloid horror story started when the romantic relationship between Maria Skłodowska-Curie and renowned scientist Pierre Langevin was revealed. He was formally married but was estranged from his wife, which didn’t discourage all sort of scandal sheets and gossip rags from accusing Maria of all the wrongdoing of the world. It’s not hard to imagine what being the star of a moral scandal meant to a studious introvert. She managed to get through it thanks to her friends and family, but always referred to it as one of the heaviest blows she received. But eventually, Maria Skłodowska-Curie managed to turn her unwanted popularity into things she actually wanted. In the beginning of the 1920s the continuation of her studies required at least 1 gram of pure radium, worth approximately $100,000 and there was no way Maria or the Radium Institute she ran in Paris could afford it. Looking for sponsors, she teamed up with Mary Matt Meloney, an influential American journalist. She organised a fundraising campaign amongst America’s rich but also took care of curating Maria Skłodowska-Curie’s public image in the US. Her efforts brought results. In 1921, Maria toured the United States giving lectures and interviews, and everywhere she went she was greeted as a saviour and a star, with masses of people cheering and photographers wrestling for the best shots in the press areas. As exhausting as this journey was for her, it earned enough money to buy 2 grams of pure radium and continue her research. Marie Curie is of all celebrated beings, the only one whom fame has not corrupted. Maria Skłodowska-Curie (or Marie Curie, as she is known to the world) was born in Poland as Maria Salomea Skłodowska and throughout her lifetime she was also very much devoted to her fatherland, standing for its regaining independence and after it did, fostering its reconstruction, by founding the Radium Institute in Warsaw, amongst other things. On the other hand, she earned a place in the Panthéon and according to a 21st century poll conducted by the magazine l’Histoire, she was the most celebrated French national hero (she occupies the podium together with Jean Moulin and Joanne d’Arc) because even though she was an idealistic pacifist she didn’t stay idle during World War I. In the beginning of 1914 she presented to the French government a precise plan for creating mobile radiological laboratories and training technicians and doctors. Her idea was accepted, and she personally started training personnel and devoting all her time and assets to the development of field medicine. By the end of war she had 300 mobile radiological laboratories up and running, with every one of them having conducted a few thousand examinations. Thus, after the Treaty of Versailles, she became a French national hero. Believe it or not, but French people laugh out loud when someone says she was Polish and vice versa. The debate on her nationality is a friendly but never-ending struggle between the two nations. Sources: 'Maria Skłodowska-Curie' by Francoise Giroud, 'Marie Curie' by Laurent Lemire, Autobiografia. Wspomnienia o Piotrze Curie by Maria Skłodowska-Curie.